linking earning to learning & giving to growing! Welcome! I am Kelly Jayne McCann, professional organizer & clutter coach, founder of OrganizingMaven.com. I launched Get Organized For Good because I saw a real need for a better, easier and simpler way to to fundraise. I spent years as a fundraising mom, asking for donations, planning events and selling almost anything you can think of. I also spent many years as a nonprofit board officer where fundraising was a never ending task. To say I understand funding gaps and know just how hard they are to fill, is an understatement. I get it! So now I am following my passion, blending my business, marketing, organizing and coaching skills to reinvent what fundraising looks and feels like. I’m on a mission to help schools not only raise the funds they need, but also help them impact their community. Get Organized For Good helps schools and organizations raise money in a truly unique way. There are loads of fundraising options out there. However, most fall short in providing any kind of lasting value to the consumer. They’re often over-priced or unhealthy, and rarely fill a real need. We offer something different: Practical and easy to use products, like planners, printables and how-to guides, that empower people to create positive change in their lives. The focus is on helping people get organized, simplify life, manage time, reduce stress, create balance and so much more. Today’s world can be chaotic and demanding, Get Organized For Good offers the perfect antidote – compelling products (delivered immediately via digital download) to help individuals and families enjoy a better quality of life! And that’s something everyone wants. Raising money is the goal, but what if you could also positively impact your community and create real value? What if you could help make your community happier, healthier and more successful? Get Organized for Good was born out the idea that fundraising should be an opportunity for growth all around. Financial growth for your organization and personal growth for your supporters. Our mission is to help you fund your initiative in a practically effortless way, while providing your supporters with a daily return on their investment. We’re making fundraising easier and more rewarding for all involved. You earn at least 50% and your supporters get a product that will help them improve their quality of life! Sounds good, right? It is! Everyone wins. The big question is always how does it work? It’s all online, super simple and seriously streamlined. By harnessing the power of the internet we can provide product delivery to anyone with an email address. 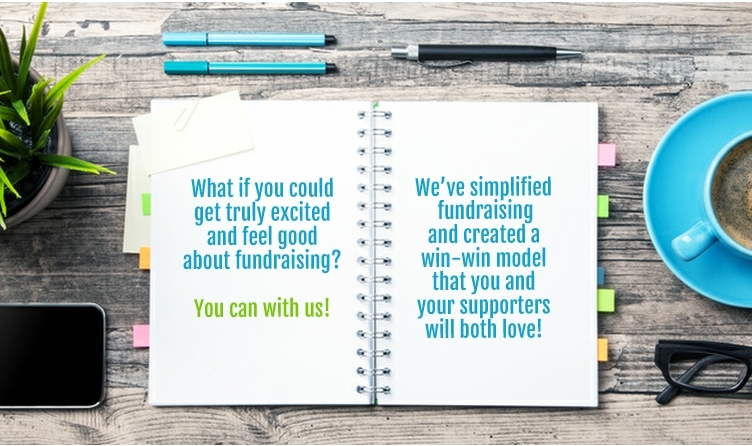 Through the use of simple technology we eliminate all the usual effort associated with fundraising. All you have to do is virtually share your custom sales page link (we create and brand it just for your cause). All orders are placed directly through your customized sales page by the customer. And product delivery is immediate – no waiting! How gratifying is that?! You can get all the details and play-by-play of the process here. We’ve broken it down step-by-step. You’ll see you always earn at least 50%! All fundraising takes place online. You’ll be provided with your own custom created information and sales page. Plus all the support to go with it. Including custom copy that you can use for social media, newsletters, websites and email appeals. All you have to do is share the info – and it’s so easy! Your custom link will lead everyone right to all the information they need to make a purchase and support your cause. And when they do, the products they choose will be delivered immediately, right to their email inbox in a universally accessible PDF format that they can save and use forever. Sales potential is unlimited because you can share with friends and family anywhere in the world. The online feature means you never have to go door-to-door, you never have to collect orders, and you never have to deliver orders. Let’s talk about time. Your campaign can begin in as little as four weeks. You decide how long you’d like to run it. We’ll be there to guide you and we’ll provide you with custom sales information so you can make the most of your time. Here’s the real benefit of working with Get Organized for Good, your time investment will truly be minimal. There is no sales pitch to practice, no order forms to distribute (or collect), no samples to hand out, and no product to deliver. Beyond that, your team will also have access to an informational video that explains the whole process, so everyone will be in the loop and feel included. Your questions are welcome! So feel free to ask away…..anything goes!